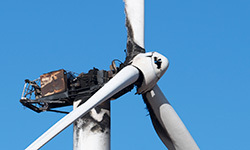 Research undertaken by Imperial College London in conjunction with Edinburgh University and the SP Technical Research Institute of Sweden in 2014 found that fire is the second largest cause of incidents in wind turbines after blade failure. Considering the vast costs for constructing wind turbines, this statistic offers enough justification to consider specific fire prevention, detection and fighting questions. Fires in wind turbines can start when flammable materials such as hydraulic oil and other flammable materials are in proximity to hot machinery or electrical equipment. Oils can catch fire if the gearbox or generator overheat, and high winds can potentially fan the flames. Lightening strikes can also spark a fire. Once started, the fire is unlikely to be brought under control due to the height of the turbines and the location of wind farms, which are normally a significant distance from the nearest fire services. Measures can be put in place to protect against lightning strikes. Fire-resistant hydraulic fluids and lubricant oils reduce the likelihood of a fire and the latest wind turbine designs incorporate heat barriers to protect materials that can burn. It is also recommended that manufacturers use non-combustible insulating materials. Intumescent materials (materials that expand if exposed to fire and therefore choke the fire) can help to suppress fires at an early stage. Systems can be installed to continuously monitor the condition of machinery so that maintenance and engineering work can be undertaken in a timely manner and the system can be shut down before a fire develops. Should a fire break out there are fire detection systems that can be employed in conjunction with fire suppression systems and an automated shut-off. If a fire were to break out whilst an engineer was working within the nacelle (the outer casing at the top of a turbine) a fire detector would also give an early warning. Fire suppression systems that are triggered by rises in temperature or by fire detectors are fitted in some turbines. Gas suppression systems work best in airtight environments. However if the ignition source has not been eliminated the fire may reignite once the gas has dispersed. Systems that are able to extinguish flames with water, foam or powder have the disadvantage that they might damage equipment. Automated suppression systems might also have to be disabled while engineer work in the nacelle to prevent suffocation, inhalation or, in the case of powder, obfuscation (a powder discharge in a small room can blind the operator). Safelincs spoke with representatives of one of its customers, energy company Vattenfall, regarding the siting of fire extinguishers. The company has turbines from a number of manufacturers. In some cases the portable extinguishers are situated as a permanent fixture within the nacelle. In other cases the engineer will carry an extinguisher with him as part of his tool kit. The downside of standard fire extinguishers is that they require an annual service carried out by a qualified extinguisher engineer and a refill needs to be undertaken for most extinguishers after five years with the unit replaced after ten years. Since a visit to turbines by an external extinguisher engineer is usually hard to achieve, a service-free fire extinguisher is a better solution. 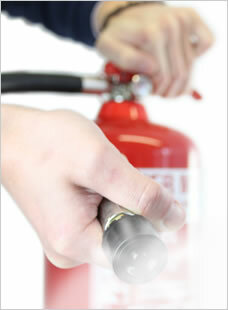 Safelincs can offer a range of service-free foam extinguishers in 2 ltr and 6 ltr sizes. These fire extinguishers are manufactured in the UK from non-corrosive materials and feature duplicate pressure gauges. They only require an annual visual check by any member of staff, e.g. the turbine maintenance engineer. They also do not require a refill after five years. Instead, after ten years they can be refilled and used for a further ten years. The resistance to a corrosive maritime environment makes these extinguishers particularly well suited to the wind farm industry. The extinguisher in this case must be light, broad spectrum, safe for use on electricity, non-damaging to equipment and harmless in the case of inhalation. There must also be no risk of asphyxiation. Safelincs can offer a range of portable water mist extinguishers, which can be used on grease, oils, electric equipment (up to 1000 Volt), fabric and plastics. The extinguishers create a very fine mist of de-ionised water that cannot conduct electricity. The inhalation of the water mist is not harmful and the mist does not leave a deposit. 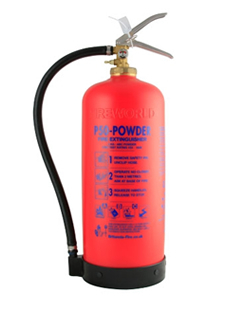 Following the great success of the 6 kg/ltr powder and foam P50 service-free extinguishers in working environments as varied as offices, refineries, farms, schools and churches, Britannia has now also launched 2kg powder and 2ltr foam versions of the service-free extinguisher. 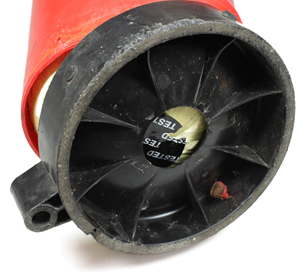 Like the 6kg/ltr versions, the smaller variant is manufactured with a corrosion-proof inner plastic cylinder cocooned by Aramid fibre to hold the chemicals and pressure. The extinguisher is then finished with an outer UV-proof sleeve and corrosion-free fittings. Like the larger extinguishers, the smaller series is, of course, kitemarked and CE marked and can be factory re-furbished after 10 years. It also features the same industry leading 10 year warranty of the larger P50s. All service-free extinguishers from Britannia only require a simple, annual visual inspection which is carried out by the owners or their representatives. They do not require any visits by an extinguisher technician and no refill after 5 years. offshore wind farms: Wind turbine housings require small fire extinguishers. The 2 kg/ltr version of the P50 is ideal and is easily visually checked annually by the engineers carrying out the regular mechanical maintenance of the turbines. buses and taxis: the traditional maintenance of small on-board extinguishers is very expensive, as it requires service technicians to be based at bus depots at night time. With the 2kg powder P50, the annual visual inspection is carried out by the depot technicians when engine services are carried out. small boats and narrowboats: The P50 extinguishers are Boat Safety Scheme approved and are ideal in the corrosive environment of rivers and sea water. The 2kg powder extinguisher is ideal for engine compartments, while the 2 ltr foam extinguisher version is perfect in the kitchen and living compartments on boats. farm machinery: diggers, tractors and other machinery require small powder extinguishers. The maintenance of these is challenging, due to the working pattern and remoteness of the machines. The 2kg powder P50 can be installed on the machines and is visually inspected annually by farm staff without the need for any external visits. market stalls: market stall holders are required by their insurance to have small extinguishers with them. Due to the regularly changing location, it is difficult to arrange for service engineers to carry out the maintenance. Again, the small service-free P50 extinguishers are here extremely helpful, as they can be inspected by the stall holder. 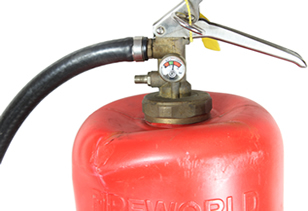 rented properties: Many landlords provide small fire extinguishers in the kitchen. The problem is then to arrange annual maintenance in daytime when tenants are often working or out of house. 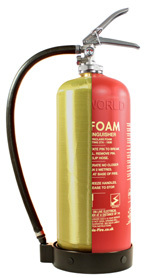 The 2ltr P50 foam extinguisher offers here a perfect solution. 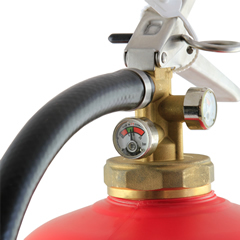 The landlord or any handyman can visually inspect the extinguisher on repair or inspection visits. hotel rooms: Hotel rooms, especially when containing any cooking facility, often feature a small extinguisher. To avoid disturbance of guests, the 2ltr P50 foam offers a great way forward here. Rather than requiring a service engineer, hotel staff simply carry out the easy annual visual inspection and record the finding in the fire safety logbook of the hotel. One of the most distinguished and prestigious private schools in the country has opted to reduce the cost of extinguisher provision by purchasing service-free P50 extinguishers across its estate. In all, over 1,000 appliances are being installed and commissioned by Safelincs engineers. Unlike traditional extinguishers, P50s do not require an annual service by an external engineer; nor do they need refilling after five years. After ten years they can be refilled and used for a further decade. The reason for their comparative longevity lies in their construction, which uses materials that are totally corrosion-free. Each year, a simple visual inspection by a member of the school’s own facilities team is all that is required and if new members of staff need to know what to do, they can view a video on the Safelincs website. The decision by this distinguished educational establishment will see it save servicing costs over the coming years – and will be a contributing factor in ensuring that its young boarders remain safe at all times. 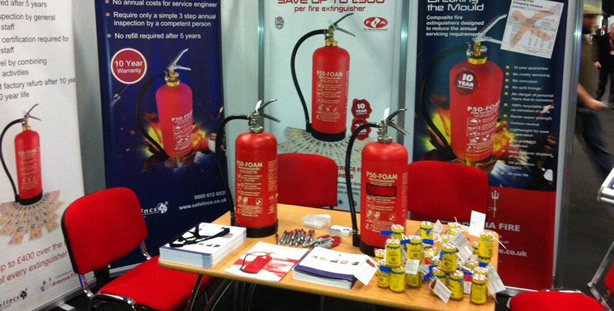 APEA, the UK’s Association for Petroleum and Explosives Administration, has just awarded their 2014 Health and Safety Performance Award to Britannia for their P50 service-free fire extinguisher during the APEA Live 2014 Exhibition and Conference on the 5th November, where we exhibited the extinguishers jointly with Britannia. 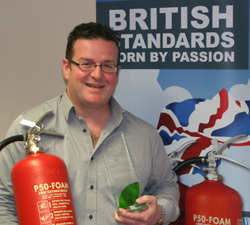 Safelincs is key marketing and distribution partner for the Britannia P50 extinguisher. APEA represents the petroleum industry, including national regulators, local government authorities, oil companies, equipment manufacturers, forecourt operators and suppliers. Their yearly exhibition is visited not only by their members and suppliers but also by specialist sections from various fire brigades, fire service academies and other fire safety organisations. The Health and Safety Performance Award at the conference was sponsored this year by Franklin Fueling Systems. The award is conferred to the organisation with the best health and safety system or programme. This award for the kitemarked P50 extinguisher is one of many acclamations for the products. The P50 extinguisher has now achieved a strong foothold in the fire safety industry, with customers as diverse as councils, colleges, refineries, schools, insurances, office, farms and other industries moving to the service-free regime of the P50s. Britannia is currently investing further into an increased production line output, for example a new quarter of a million pounds blow-moulding machine for the inner chemical cylinder. P50 extinguishers do not require visits from service engineer and do not need to be refilled after 5 years. Instead they are visually inspected once a year by the customer and the check is recorded in the fire safety logbook. When Safelincs installs these extinguishers, our engineers first carry out a site survey and then install and certify the extinguishers. We then train local staff in the visual inspection of the extinguishers and issue a training certificate. We recommend that the customers subsequently notify their insurers about their changed maintenance regime. With budgeting in mind we offer a phase-in programme to ease the changeover from traditional extinguishers to the P50s. 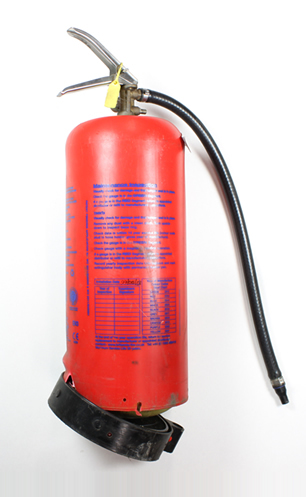 This ensures extinguishers are only replaced when they are due for refill or replacement. Portable fire extinguishers in refineries and forecourts are exposed to weather and extreme temperatures and, on top of heavy handling, sometimes face a corrosive atmosphere. Traditional fire extinguishers, made from painted steel with an inner protective lining can corrode, often get dented, burst if the contents freeze and can experience detachment of the inner protective lining. All of these issues will lead to the extinguisher being condemned at the annual extinguisher service, resulting in you having to replace it. This leaves the owners with replacement costs on top of the annual servicing charges, refilling charges every five years and the problem of supervising external subcontractors onsite. In larger refineries and production facilities the cost for supervision of every sub-contract engineer and issuing safety instructions can be significant. During the annual service, traditional, stored pressure extinguishers are visually inspected from the outside and the pressure of the extinguisher is checked. Every five years, the extinguishers are opened, emptied and the inside is inspected for rust or lining detachment (showing as bubbles). The chemicals within the extinguishers are usually not re-used due to the fear of contamination from rust or the impact of moisture. In short, most of the inspection activities are linked to the fact the extinguishers are made of steel, can corrode and can be dented. Britannia, a long established manufacturer of portable extinguishers in the UK, in partnership with Safelincs can offer a solution which addresses all these issues. Britannia’s P50 fire extinguishers are made from composites and brass. The extinguishers have an inner 3-layered PA cylinder that contains the fire fighting agent and does not corrode or interact in any way with the chemicals. This cylinder is tightly wrapped in aramid fibre (Kevlar is the best know aramid), a fibre that is stronger than steel (per weight) and which takes up the pressure from the extinguisher. The extinguisher core is then contained and protected against UV light by a red plastic mantle. The head and valves are made from brass and stainless steel. The extinguishers are almost indestructible – even the most serious knocks will not damage the P50 extinguishers. To test their resilience at the production plant, every 500th extinguisher is destruction tested: The extinguishers are pressurised 12000 times between zero and 25 bar. After this demanding test they are crushed flat by a metal blade and re-pressurised to over 55 bar without being allowed to burst or leak! In the tests P50 extinguishers actually only burst at around 85 bar! These extinguishers are corrosion-proof and have a far superior pressure resistance than steel extinguishers. As the chemicals are not reacting with the cylinder, there is no need to refill the extinguisher after five years. The manufacturers of the chemicals have certified that the chemicals used in the P50 extinguishers will not require refilling for at least ten years. After the ten years, Safelincs, the main distribution partner of Britannia, offers an exchange service. The returned units are re-filled and can then be used for a further ten years! As corrosion, lining detachment and dints will never be a problem for the P50 extinguishers; the only inspection requirement left is the verification of the internal pressure to detect any potential leakage. To give extra peace of mind Britannia has fitted two German-made pressure indicators to each extinguisher. Normal extinguishers only have one pressure indicator. The requirement to regularly check pressure indicators applies both to traditional extinguishers and the P50. The general recommendation is that extinguisher pressure indicators should be viewed in passing about once a month by end users to ensure that they are still showing the indicator needle in the green area of the indicator. The real difference to traditional steel extinguishers is the replacement of the annual service by an external engineer with a simple annual visual inspection by the end users or their representatives. This inspection is boiled down to a very swift visual inspection of pressure indicators and the extinguisher outer body to check for any visual damage from the outside. This inspection is then recorded on the back of the extinguisher and in the company’s fire safety logbook. This visual inspection requires no skill or tools. Nevertheless, when Safelincs installs the extinguishers at the customer, they train site staff in the visual inspection process and will certify their training to confirm that staff are competent to visually inspect the extinguishers. As a back-up there is also a video on the Safelincs website that runs through the process. The P50 extinguishers are kitemarked and LPCB approved. They are also CE marked and marine approved. All major insurance companies accept the reduced servicing regime, as long as evidence of the regular visual inspection is kept in the standard fire safety log books in the same way as for any other extinguisher types. Britannia offers a ten year guarantee for all P50 extinguishers, offering complete peace of mind. P50 extinguishers are installed in refineries, petrol stations and many other outdoor locations. It was in one of the refineries that the extinguisher shown below was photographed after it had been run over by a van – it was still fully pressurised! These composite extinguishers cost in the region of £100-£150, depending from order volume, including site survey, installation, training and certification. They save the customer the costs of the annual service and the five-yearly refills/replacement. Due to the refurbishment after ten years (at around half the price of a new P50) the lifespan of the extinguisher is twenty years. A simple and conservative calculation, comparing it with Safelincs’ own and very competitive standard extinguisher range, identifies the savings. We have only considered a ten year period, although the savings over 20 years are of course much larger: The savings indicated below are per unit. As mentioned above, the real savings are higher when a 20 year period is considered. Larger customers are also achieving much better purchase prices in the first place. The P50s have more than double the A rating, allowing drastic reduction of numbers in offices and work places. 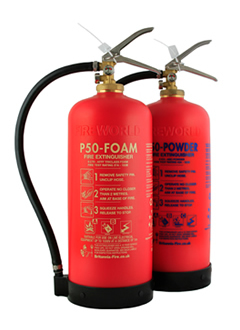 The P50 foam is also suitable for use on electrical equipment, allowing the replacement of the CO2 extinguishers found in many locations. Traditional foam extinguishers often do not have that capability! We will, of course, also remove your old extinguishers free of charge and dispose of them responsibly. APEA Live 2013 is a trade show for the petroleum and explosives industry (APEA stands for ‘Association for Petroleum and Explosives Administration’). Safelincs and Britannia jointly exhibited the P50 service free extinguishers to the refinery and forecourt industry. The P50 is particularly well suited to the harsh refinery and forecourt environment and reduces the cost of compliance dramatically, as traditional yearly fire extinguisher inspections in a safety critical environment require members of staff to accompany the service engineers. The P50, which only requires a visual inspection once a year without any servicing activities cuts out these burdens. The extinguishers are simply visually inspected by regular site safety personnel who receive introductory training when Safelincs install the extinguishers. The extinguishers have a ten year warranty and after ten years the P50 are re-furbished, giving them a further ten year life. The show was well attended and we met some well known faces and made some new and exciting contacts. Extinguisher run over by van – still pressurised! We were always convinced that our P50 service free extinguishers made from a Kevlar-type aramid were almost in-destructable. Nevertheless, when one of our engineers was visiting one of our customers, a refinery on the east coast, he was surprised when he was handed a fire extinguisher that had been run over by a van and that it was still fully pressurised! This is not that surprising when you know that 1 in 500 of these extinguishers are tested by pressurising them 12,000 times from zero bar to 25 bar. And after they have undergone this harsh test, they are crushed flat by a steel blade before being re-inflated without being allowed to leak at 55 bar! The P50 service free extinguisher is suitable for the harshest of environments, including outdoors. Safelincs is very happy to be leading the way by supplying two innovative types of fire extinguisher – the Jewel Water Mist Extinguisher and the Fireworld P50. Both are attracting attention from those with an interest in fire safety. But what are the considerations when deciding which type to buy? Here we examine the benefits of each type of extinguisher and consider where they might best be utilised. Water mist extinguishers (also called E-series or ‘dry’ water mist extinguishers) have a supersonic nozzle that disperses microscopic ‘dry’ water mist particles to suppress fires and extinguish burning materials quickly and easily. The nature of these particles means that they can be used on just about every type of fire, including fat fires. The ‘dry’ mist is 100% environmentally friendly as it is just de-ionised water. There are no nasty fumes or residue to deal with – it is a clean way of tackling a fire – and the water mist also protects the user from heat. The speed at which the water mist smothers the fire, as demonstrated in this video, is very impressive. The fine mist also suppresses and minimises the acrid smoke generated by the fire. The water mist extinguisher is proving popular in hotel and restaurant kitchens where even a deep fat fryer fire can be quickly dealt with. But what makes it so appealing is that there are no fumes or residue to clear up. Using a powder or foam extinguisher, even on a minor fire would leave a lot of mess. This would mean throwing away any food in the vicinity and maybe even having to temporarily close the kitchen, causing inconvenience and loss of revenue. In a recent hotel fire, a croissant placed in a toaster designed for bread caused a fire to break out. The water mist extinguisher quickly put out the fire and, after it had been inspected and PAT tested, the toaster was put back into service. The lack of residue also makes these extinguishers popular in museums and heritage buildings. Very often, when fires occur, the process of extinguishing them can cause more damage than the fire itself. 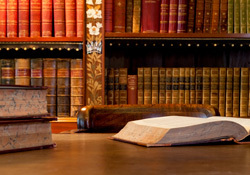 In an environment where valuable paintings or artefacts are present the opportunity to install an extinguisher that will minimise residual damage is attractive. The one litre version is fast becoming a favourite for use in the home. The water mist extinguisher will cope with any likely domestic fire and there are no residual fumes that would harm children. Where fire extinguishers are installed there is a requirement to have them serviced annually by a qualified engineer – an expensive business. But this is where the Britannia Fireworld P50 comes into its own. It has been designed so that it requires only an annual inspection which can easily be carried out by a member of staff. (There’s even a demonstration video on the Safelincs website). Unlike most extinguishers it does not need refilling after five years. And the P50 is guaranteed for ten years, after which time it can be refilled and used for a further ten years. 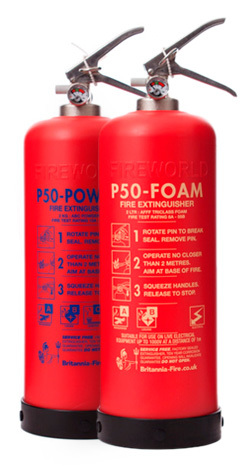 The Fireworld P50 comes in foam and powder versions so any organisation currently using these types of extinguisher has the opportunity to switch and drastically reduce their bills. Safelincs is the Church of England’s chosen fire safety provider and recently installed eight P50s at St Margaret’s Church in Warnham. Previously St Margaret’s was paying between £500 and £749 per year for its extinguisher maintenance but will now not have to pay a penny for ten years. The other significant advantage of the P50 lies in its construction. The main body is a strong composite plastic which is reinforced with the material from which bullet proof vests are made. The metal fittings are brass which means that there is nothing in the extinguisher’s make-up that will rust or corrode. Hence the extinguisher is ideal for outdoor use or anywhere that might be subject to moisture such as farms, swimming pools, oil rigs, wind farms, garage forecourts, railway stations and building sites. And it is very tough and won’t dent in the way that metal extinguishers would. P50 also finds favour with environmentalists, both for it being 100% recyclable when it reaches the end of its life and for the reduction in miles travelled by engineers. At Safelincs we believe that both these types of extinguisher offer significant advantages. Our friendly and knowledgeable staff will be happy to discuss further the merits of each extinguisher to help you decide which is best for you. The Britannia P50 maintenance free extinguishers are now also MED (Marine Equipment Directive) approved and can be used on oil installations, rigs and ships. The extinguishers are already kitemarked, Boat Safety scheme approved and CE marked and had a very successful introduction. Now the MED approval opens an entirely new market. The P50 range are robust and non-corrosive, making them an ideal extinguisher to install on boats and ships. Gaining the MED approval will give buyers the confidence to install this range of extinguishers. They are guaranteed for 10 years and do not require the usual discharge and refill after 5 years. No engineer visits, no consumables and no replacement components are needed for the entire lifetime of the extinguishers. Being maintenance free the P50 extinguisher will save you money and time. A quick annual visual check can be carried out by members of your staff after the initial installation and a short instruction session, which is included in the price, meaning you can verify yourself that your extinguishers are in working order no matter where you are.